This week, I did something about which my rational self continues to fret: I took the screen protector off my iPod Touch. My naked iPod. Ain’t it purdy? It had served me well, honestly, though had at length grown so marred and scratched that the device itself had become almost unusable. I couldn’t read the text beneath the blemishes, and some parts of the screen no longer responded when I touched them. Somewhere in the house, lost in the back of a drawer, is a pack of replacements. I don’t know, however, if I’m too concerned about finding them. I am realizing again, however, that despite its age, my second-generation iPod Touch remains a beautiful, functional delight to use. A little history: this wasn’t my iPod. 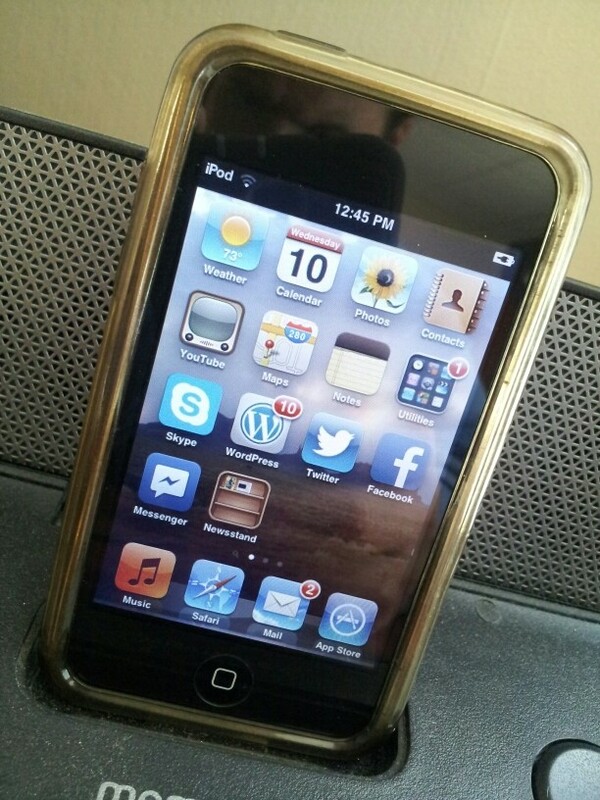 My wife came in from work one night and a coworker had brought in an iPod Touch and my wife decided she simply had to have one. About a day later, she had one. (That’s how things work around our house – I go months with holes in my shoes but she sees something shiny and, boom, there it is. Not that I’m complaining; there are advantages to having a happy, satisfied wife.) She loved it; it connected to our Wi-Fi, so she could flit around Facebook with it and look up things on the fly (even though her Blackberry Curve served more or less the same function, except, you know, less fun). It held her music, streamed music, etc. I didn’t get jealous until my Zune – which I still contend to be a superior all-around media player – went kaput. When she enrolled in the master’s program at her university, they promised the students would receive “personal digital organizers.” Turns out, they were giving them iPod Touches. So, she got a new one – one with front- and rear-facing cameras – and I got her hand-me-down. I was delighted. I listen to it on my morning treadmill jaunts, while cutting grass, doing housework, driving to and from work, etc. More, it’s an excellent distraction for our 5-year-old. My iPod Touch is festooned with Dora the Explorer games and puzzles to keep her happy. Plus, she loves to hear the “Take a Little Beans Song” (Johnny Horton’s “Battle of New Orleans”; “…we took a little bacon and we took a little beans, and we caught the bloody British in the town of New Orleans…”) when I pick her up from day care. However, I had been using it only begrudgingly for months. It was showing its age, with a grimy-feeling back and mangled screen. I was considering abandoning it altogether and trying to transfer all my media over to my Samsung smartphone. But, that iPod and I had been through a lot, and I felt I owed it another shot. So, I stripped it naked, removing the disco-looking rubber case that also I had inherited from my wife, and with some Zep glass cleaner, I scrubbed and shined it back to new. And like a car runs better after you take it to the car wash, the little device is once more proving a delight. Now, I’m not hurting for digital distraction. In fact, I’m genuinely blessed with a laptop, Android tablet, Android smartphone, Xbox 360 and so forth. But seeing the shiny, clear screen of my iPod and flipping through my many playlists, I get not the sense of nostalgia I anticipated when I began resurrecting it; rather, I feel excited for the new places the palm-sized sucker can take me, through my Twitter feed, Facebook friends, news alerts and more. So, it’s old. It doesn’t have a camera, and it’s not an iPhone. Big whoop. When I’m at home and I’m in the mood for a tune, I can still just dock this little guy almost anywhere and rock out. That’s awesome. Now, we’ll see how the no-screen-protector-thing works out after I hand it off to my 5-year-old again.